PlayBox Technology has delivered a fully integrated multi-channel DVB workflow to Poland's Kino Polska, using AirBox DVB streamer for playout, DVB SubtitlePlus servers, and a DVB Muxer. PlayBox Technology has delivered a fully integrated multi-channel DVB workflow to Poland’s Kino Polska, writes David Fox. It is part of the SPI group, which delivers a bouquet of 15 channels that include nine FilmBox film channels, plus FashionBox, FightBox and DocuBox. All channels are broadcast in 16:9, most in HD, and are transmitted to Central and Eastern Europe. Kino Polska chose AirBox DVB streamer for playout. 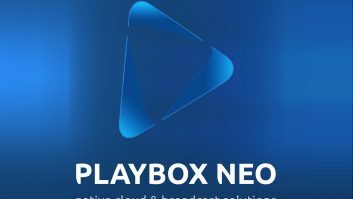 “PlayBox Technology offers a unique and reliable DVB platform including an excellent subtitling solution, quick and reliable support and, last but not least, all at a very reasonable price”, explained Marcin Kowalski, Managing Director of FilmBox and Kino Polska channels. Kino Polska has been buying PlayBox equipment since 2010 and so far purchases include: 12 HD AirBox servers; two DVB SubtitlePlus servers; and a DVB Muxer. “We use a simple streaming workflow to power our channels in different countries. The different channels use DVB SubtitlePlus servers, which support up to 255 languages. Using PlayBox DVB Muxer greatly simplifies our job and we distribute the signal with subtitles in multiple languages into multiple countries. Depending on our needs the output streams can be IP MPEG-2 or H.264,” he said. Future plans at Kino Polska TV include expanding the DVB workflow to open more channels in Poland and other parts of Central and Eastern Europe. These will be based on the same workflow with HD streaming, DVB subtitle servers and multiplexers.